PARIS Japan's stock market plunged and other global shares followed Thursday amid concerns that central bankers in the U.S. and Japan might turn off the tap of money that has kept markets afloat during the economic crisis. The worry has been growing ever since chief of the Federal Reserve, Ben Bernanke, said it might pull back on its $85 billion-a-month bond-buying program -- known as quantitative easing -- if economic data, especially hiring, improves. Now Japanese media reports are saying overseas hedge funds may be dumping the country's equities following disappointment over the Bank of Japan's decision earlier in the week to refrain from additional monetary easing measures. "Ever since talk of Fed tapering was first mentioned U.S. bond yields have edged higher and money has leaked out of emerging markets and emerging market currencies," said market analyst Micahel Hewson of CMC Markets. "Of course there is the other reason that for all of the stock market gains of recent months investors have finally woken up to the fact that current stock valuations are not supported by fundamentals in the current low-growth environment, and all the QE (quantitative easing) in the world can't address that particular issue." 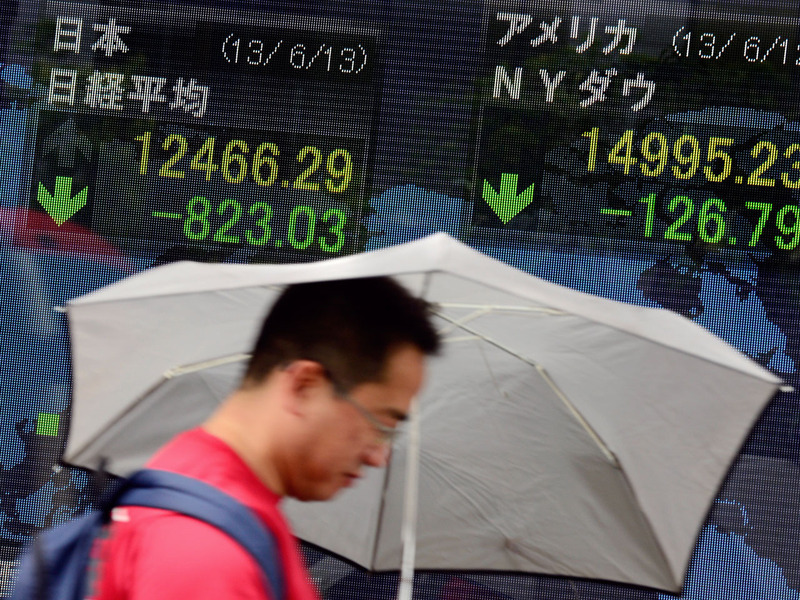 The Nikkei 225 index plunged 6.4 percent to close at 12,445.38. Adding to the woes was the dollar's recent fall, trading at about 94 yen late Thursday, slipping momentarily to 93-yen levels. A rising yen spells bad news for Japanese manufacturers because it will make their exports look more expensive overseas. In early afternoon trading in Europe, Britain's FSTE 100 fell 1 percent to 6,233. Germany's DAX fell 1.5 percent to 8,018 while France's CAC-40 shed 0.8 percent to 3,762. Markets are also looking at the future course of U.S. monetary policy following a solid, if unspectacular, improvement in economic data. Investors now expect some reduction in the Federal Reserve's monthly asset purchases sometime this year. The stimulus has been one of the main reasons why many assets, such as global stock markets and emerging markets, have bounced back. Analysts said markets will likely remain on edge until next week's Fed policy meeting for greater clarity on the timing and extend of any tapering. Ahead of the opening bell, Wall Street appeared headed for losses. Dow Jones futures fell 0.25 percent while S&P 500 futures lost 0.3 percent. Elsewhere, the Hang Seng index fell 2.2 percent to 20,887.04, while the Kospi in South Korea lost 1.4 percent to 1,882.73. Mainland Chinese were pummeled as accumulating signs of a slowdown in growth in the world's No. 2 economy caused investors to retreat. The Shanghai Composite Index slid 2.8 percent to 2,148.36, its lowest close in six months. Juichi Wako, equity market strategist at Nomura Securities Co. in Tokyo, said the drop in Asia was due to a reversal of the money flow that had flooded Japan in recent months, partly on inflated hopes for "Abenomics," as Prime Minister Shinzo Abe's fiscal and monetary policies have been dubbed. Much of the overwrought excitement was calming and the money was reverting to the U.S., where monetary easing might be winding down as well, he said. In April, the Bank of Japan announced a massive stimulus in an attempt to get inflation up to 2 percent. The euphoria that drove the Nikkei up to five-year highs but has since seen wild fluctuations and the index is now around 20 percent down from its recent peak. The euro dropped to $1.3327 from $1.3331 late Wednesday in New York. The dollar fell to 94.40 yen from 95.71 yen. Benchmark crude oil was down 35 cents to $95.54 per barrel in electronic trading on the New York Mercantile Exchange.